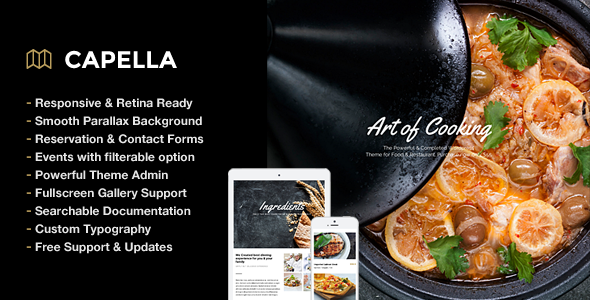 Capella is and super Parallax Cafe and Restaurant WordPress Theme. This theme has built in 3 food menus layouts. Menu Classic, Munu Card and Menu Simple. Each has its unique layout and you can also organize them into categories. Theme has built in reservation and contact form so when your customer fill the form on your website. All information will be sent directly to your email. You can create events of your restaurant easily. You can choose from 2,3 and 4 columns layouts. It als support filterable events by date and keywords. Item Reviewed: Capella Parallax Cafe and Restaurant Theme 9 out of 10 based on 10 ratings. 9 user reviews.